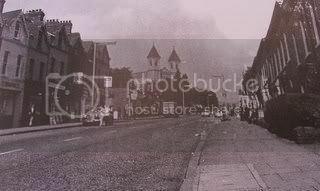 Doffer,Handcart Avenue was Urney st off the Shankill, there was a yard which hired handcarts on the left hand side, I can remember well hiring them every year to collect bonfire wood. My uncle Robert worked at Ewarts mill, he was a foreman and set-up the looms. Don't really know that much about it, but he worked there for years. The old Savoy flea pit used to go there on a Saturday afternoon to watch the matinée, Came home more than once with chewing gum stuck in my hair. Is the Crumlin gaol still there, and the barracks down on the corner, another of my Aunts and Uncles lived in one of the tower blocks. I remember the Savoy and Crumlin cinemas very well, both were flea pits but no one seemed to mind, the Gaol is still there. It is the only Victorian era prison remaining in Northern Ireland and closed in March 1996. The Environment and Heritage Service have given it a grade A listed building status because of its architectural and historical significance. The Crumlin Road Courthouse, also derelict, stands opposite the Gaol. A tunnel under the main road connects the two buildings. From BBC News September 2007. Social Development Minister Margaret Ritchie today unveiled a major restoration programme at Crumlin Road Gaol and announced plans to open the Gaol to tourists and visitors. £1million has been invested in improvements that include weather-proofing, health & safety repairs and restoration work. The façade of the Gaol has also been transformed, with security walls and fencing removed and the railings and main gates repaired. The Minister commented: “The completion of this work represents a key milestone in the redevelopment of Crumlin Road Gaol. For the first time in a generation the frontage of the Gaol has been opened up, making a very positive contribution to improving the appearance of the Crumlin Road. People can now appreciate the wonderful architecture of this listed building which was, of course, designed by Sir Charles Lanyon. “The old blast walls, razor wire and bullet-proof glass have all been dismantled. Their demise represents a tangible expression of the sort of positive change that Belfast has been enjoying now for a number of years”. What a wonderful place to run a ghost tour. I can remember my mum dropping us of at the crumlin road picture house on a saturday so that she could do the shopping in peace when we misbehaved they used to stop the film and turn the house lights up. I'm so glad i found this site as i had been hunting for a Photo of St marys church where my parents got married. My dad grew up in Harrison st.
marg, i found this site when i had put in a search for St marys church. I never knew this place existed. I now have a photo of that beautiful little church to put in a memory book for my new grand daughter. Did you know my grandmother ?